HE TURNED pro in Hollywood in 1938 and lost a four-round decision. But as if a screenwriter was scripting his career, Ortiz quickly climbed the bantamweight ranks with wins over such quality opposition as Tony Olivera, Little Pancho, and Jackie Jurich. In 1942, he scored a 12-round decision over Lou Salica to win the bantamweight title. He defended that title 15 times over the next four years, including eight title defenses in 1943 alone. Finally, in 1947, Manuel lost the title on a decision to Harold Dade. But in a rematch he regained the crown by decisioning Dade two months later at the famed Olympic Auditorium in Los Angeles. He would go on to defend the title four more times, decisioning Kui Kong Young in Honolulu, Tirso Del Rosario in Manila, Memo Valero in Mexicali, and Dado Marino in Honolulu. In 1950, he journeyed to Johannesburg and lost a decision to young South African challenger Vic Toweel. 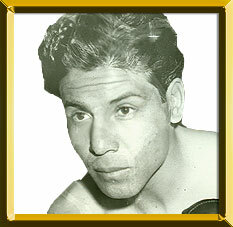 Ortiz fought sporadically from 1952 to 1954 and won four of five fights in 1955 before retiring for good. Oh yeah, and that first loss? Ortiz avenged that, defeating Benny Goldberg while defending his title.